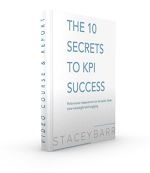 Are you struggling to get executives, managers and colleagues to want to measure performance? Do you keep telling them how important it is, how it’s essential to high performance, but they still don’t care? It’s time to get good at something that, as someone who values objective information and informed decision making, you may not like. You have to become a good marketer. PEOPLE — Who *exactly* are you trying convince that measuring is a good idea? Knowing and understanding who you want to have embrace performance measurement is your first step. That’s because how and when and what you do to get the attention of a Senior Executive is going to be very different from a front-line worker. Name each “target market” of stakeholders who you know need a better appreciation of the value of measuring performance. Then write a story about each one, describing their pains, their visions, their priorities, their biases — so you can start your campaign from a respectful appreciation of where they currently stand. PRODUCT — What *exactly* do you want them to do about measuring? If you’re starting from ground zero, where your executives, managers or colleagues really don’t have any interest in measurement, then don’t expect them to suddenly sign up for a year-long, six-figure investment in transforming the measurement system for your organisation! At least not after one interaction with you, however inspiring that might be. Decide what is a fantastic step forward for them to make, what it is you want each target market to “buy” from you. Perhaps it’s to let you lead them through pilot to measure just one performance result or problem. Or maybe it’s to have them summon up the curiosity to hear how other organisations have flourished by measuring what matters. PRICE — What must they “pay” to get the benefits of measuring? Everything has a price! And a big part of what’s probably holding back your executive, manager or colleague is their perception of what they have to give up to embark on measuring performance. The price they have to pay is certainly more than a slice of their budget. It’s their time, their staff’s time, their perceived risk of it failing or being a complete bore, a project that to them is a lot more exciting or valuable. Understand this perceived price for each target market, and you’re half way to being able to clearly lay out the return on investment of performance measurement. PROMOTION — What’s the message that will get their attention? Be very clear about the benefits of measuring performance, not the features. Your message has to be almost entirely about the “why” of measuring performance, not the steps, not the technology, not the methodology. And this will vary for each target market. If you can describe the sparkling benefits of measuring performance, you’ve got the other half of a clear return on investment of performance measurement. Knowing rather than assuming or guessing. Reaching goals faster. Improving performance with less wasted effort. Making strategy tangible and actionable for staff. Create your list of benefits as the basis of the message you want at the centre of your Performance Measurement Marketing Campaign. PLACEMENT — How can you reach the people you want to convince? When, where and how you’ll deliver your message to your target market needs some careful thought. You’re competing with a gazillion other things screaming for the attention of your executives, managers or colleagues. The quicker and more conveniently you can communicate your measurement message to your target market, the higher the chances they’ll hear it. Think about opportunities like upcoming meetings, your company newsletter, a well-crafted email or memo, even brief moments where paths cross in corridors and elevators. And a word of advice: deliver your measurement message authentically, naturally and with your honest passion, so you won’t sound salesy. Now go DELIVER your measurement message! There are various versions of the marketing Ps, but these five make fine bones for you to flesh out with your tailor-made Performance Measurement Marketing Campaign. Sure, you’ll need to practice and hone and practice some more. But action learning like that is the fastest way to go.